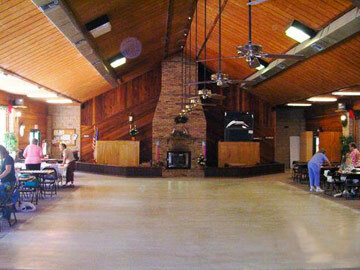 Elite Resorts at Salt Springs is home to all your favorite activities – both indoor and out. We invite you to swim in our gorgeous family or adult pool, relax on our expansive patio, and spend your nights soaking up the view while participating in activities at our lakefront lodge. Spend time with friends playing tennis, volleyball or basketball. Head out to play horseshoes with the entire family – or simply fish in the crystal blue lake. 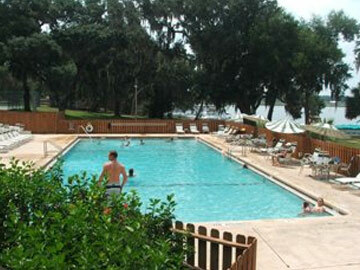 Our Amenities are FREE for park guests/owners – NO HIDDEN FEES whatsoever. Don’t forget to attend our Flea Market every Saturday! Country breakfast and lunch, including burgers, sandwiches, salads and daily specials. Phone (352) 685-2288. Full service, including Box rentals. Phone (352) 685-2325. Wash & Dry your clothes, quickly and efficiently. Have all your haircutting and styling needs taken care of by professionals. Phone (352) 685-2467. View exhibits, purchase maps, learn all the things to see and do in the forest and much more. Phone (352) 685-3070. Contact for us details. Phone 1 800 356 2460. In addition to all the fun activities to participate in at Elite Resorts at Salt Springs, there are things to do for everyone in the Ocala area (please see ‘Area Attractions’).